Mark James Skeens, 45, of Lawson, MO, breathed his first breath in Heaven on July 19, 2018. He passed from this life at K.U. Medical Center with family at his side. Visitation will be held from 5-8 pm Friday, July 27, and a service celebrating Mark's life will be held at 9:30 am Saturday, July 28, all at Pleasant Valley Baptist Church, 1600 North State Route 291, Liberty, MO. Graveside services will be at 2:00 pm Saturday, July 28, at Miriam Cemetery in Bethany, MO. In lieu of flowers, you may honor Mark with a donation to: KU Cancer Center Melanoma Research Program (c/o Teresa Christiansen) or Spoon Creek Rodeo Ministries (spooncreekrodeo.com) or North Kansas City Fire Department (2010 Howell St. NKC, MO 64116 c/o Chief Dave Hargis). Mark was born June 7, 1973, in Moberly, MO, the middle of three children of Robert and Jennifer (Chalk) Skeens. He grew up in Bethany, MO and graduated from South Harrison High School. 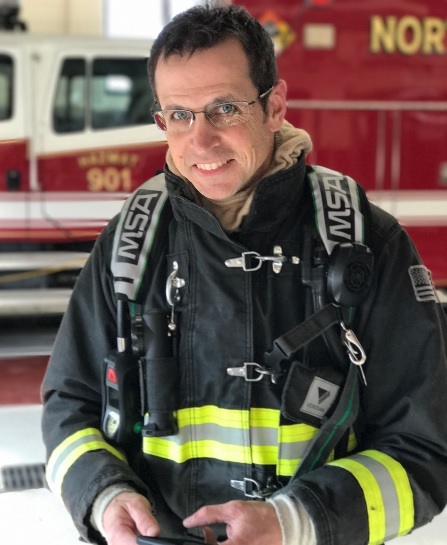 He married his high school sweetheart, Lisa Marie Kestermont, on April 17, 1993, in Salix, PA.
His career as a firefighter and paramedic with the North Kansas City Fire Department began in 2005. He was promoted to Captain in 2015. In earlier years, Mark served as a volunteer firefighter for the Bethany Fire Department as well as served fulltime on the Trenton Fire Department and the Claycomo Fire Department. He was a member of IAFF Local 42. Mark and Lisa have also operated Environmental Training Services, teaching safety training to industries since 2012. Mark volunteered for Spoon Creek Rodeo Ministries serving as a paramedic at rodeos. While Mark took great pride in his work as a firefighter, instructor, and businessman, he was not defined merely by his work. He was such a big person, measured best by his character and his personality and his insatiable love for serving others. He was a consumate people person and used his loving words of sound counsel and his unique sense of humor to draw in the people around him. A true “man’s man”, it was often said of him “Is there anything he CAN’T do?” His gifts and talents were many and varied: art, building, teaching, leading, rescuing, healing, farming, ranching, and so many more. He loved more things and loved them better than any other man. He lived out loud with an authenticity that is rare and deeply admired. Most of all Mark had a deep and meaningful relationship with Jesus Christ and he had no greater desire than to share that with others. His faith, like his heart, was passionate and worn on his sleeve. Along with his parents and wife of 25 years, Mark leaves his children, Marshall Skeens (wife Briana) and Ali Skeens; siblings, Jonathan Skeens (Stacey) and Carolyn Lehn (John); as well as nieces, nephews, other family members and many friends. He will be greatly missed by all. Lisa / family, You are in our thoughts and prayers. I want you to know my most meaningful memory of Mark is when he came to bring us Daniel"s stuff in his truck in Virginia and then came to Daniel's grave in Ohio. That meant a lot to me. May the grace and peace of our Lord and Savior Jesus Christ comfort and sustain you in this time of loss . May God's love minister to your hearts and minds. In life Mark served and helped other, may you now rest in peace my friend. Ali, I am so sorry for your loss. Your Dad was very proud of you. I will never forget the smile that lighted his entire being every time I asked about how you were doing. May you find some comfort in knowing that he loved you so much. You will be missed. Thank you for who you are and the passion you had for life. Hope to laugh with you again. Lisa & family, so very sorry to hear of your great loss. Peace in heaven with our Heavenly Father. Praying for comfort for you all & that memories & love be with you always! God’s love give you peace & comfort always. So sorry to hear of your loss. Mark lived a life of service, he helped everyone he came in contact with, in some way or another. He had a serving spirit when he was very young, I remember when we lived in the same neighborhood, he was always there to help, never asking for anything in return. He was one of God's great servants. Our thoughts and prayers are with you all. He will be missed by many. God Bless. Lisa, Jonathan, and family, our thoughts and prayers are with the family as you move forward after your loss. The Vermeer team will miss working with Mark. He was such a great person!